Monitor on Massacre Marketing: Syria Chlorine Allegations: What Killed the Talebs? 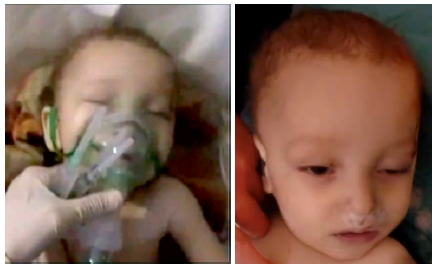 Syria Chlorine Allegations: What Killed the Talebs? Recent weeks have witnessed a passionate new drive for accountability and justice in Syria, by punishing the government of president Bashar al-Assad and – more urgently - protecting civilians there from its indiscriminate aerial attacks. Renewed calls for a "no fly zone" over at least part of Syria are based on the claim that the government had its helicopters repeatedly drop chlorine gas on Syrian citizens in rebel-held areas of the northern Idlib province, just before and after the Islamist rebel conquest of the regional capitol. Many influential people have accepted and promoted these claims, but it seems they did so without seriously scrutinizing them. The first alleged chlorine attack on March 16, in Sarmin and/or Qmenas, was the only one so far that yielded a death toll higher than one. By reports this night attack with four barrel bombs affected over 100 and killed a family of 6, named Taleb (as given). As many now know, this family included 3 children ages 3, 2, and about one year, who were widely seen on video dying a heartbreaking and preventable death in a rebel field hospital's emergency room. This footage was famously shown at a closed UN Security Council meeting on April 16 that event organizer U.S. ambassador Samatha Power called "very emotional ... if there was a dry eye in the room I didn't see it." (BBC) With that emotional charge and the opposition activists providing the narrative, the perpetrators should have been clear, if not the exact way forward. However, as some critics have noted, the case for blaming the government (primarily, that a helicopter was involved) comes on the word of anti-government activists who might blame their enemies for anything, true or not. The video record is also provided by the same activists, but at least that includes verifiable information - the camera itself doesn't lie. And so this is the main sector examined at the research wiki A Closer Look On Syria (ACLOS). Some educated people around the world have teamed up there to work out what really happened, correlating all publicly available evidence but especially the visual-verifiable kind. The result is a dramatically different narrative than the one provided by Mrs Power and her activist sources. The page is full of fascinating thoughts and information, worth going over but a bit hard to navigate (a natural result of our open discussion process). The main article will be filled-in eventually, but first the best findings are being revised and organized into a single detailed report worthy of the subject. It's a lively process with input from different researchers and professionals that's not completed yet. But the issue is too urgent to wait entirely, so we point to this advance summary, citing the most relevant sections of the ACLOS page. Clinical signs point away from chlorine, and from aerial delivery and towards a locally-administered drug overdose. A disturbingly unsuccessful medical effort helped seal the six deaths. The Talebs probably did not come from the unexplained massacre site. Activist-Terrorist cooperation in providing the narrative blaming the Syrian government. Video 1 1:47 – Video 2 1:54 – est. gap between = 0:30 to 2:00, total est. time-span = 4-6 minutes. 1a. Chlorine signs absent: The accepted indicators of chlorine exposure include: reddened and watering eyes, red face and skin irritation, coughing violently, likely with mucous, agitated and anxious, and short of breath. Unconsciousness can occur in the extreme stages. Activists and allied medics describe the Sarmin victims – including the Talebs – as displaying signs of this sort. Reported as the only victims trapped in a basement apartment with the gas for some time, the family should, in fact, show the clearest exposure signs of anyone. But the visuals disagree with the description, at least for the Taleb children. In comparison, they appear flaccid and completely unresponsive, with white, watery, vacant eyes, and uniformly pale skin. They don't cough at all or, in fact, show much sign of breathing. These signs are quite similar to those of death, and a death without any serious chlorine exposure before it. But the youngest child (as given, Mohammed Waref al-Taleb) is clearly alive at the start of the first video and suffering what seems to be an intermediate coma and severe respiratory depression (described below). The girls (as given Aysha and Sara Waref al-Taleb) may be dead on arrival or comatose like him; it's hard to be sure. 1b. Signs point instead to drug overdose: Victims of fatal exposure to chlorine have damaged lungs and struggle to breathe, but usually remain awake until the end. Mohammed however does not open his eyes, does not vocalize, and does not make any spontaneous movements after 0:04 in video 1. There we can see his head turning a bit to the side and his mouth opening in a sort of mild yawn (shown at right). These signs indicate a decreased level of consciousness (coma). He does not struggle to breathe but simply stops breathing, indicating a loss of respiratory drive (the system in the brainstem that maintains breathing even in deep coma). The coma and respiratory depression shown by Mohammed is consistent with exposure to a central nervous system depressant that also depresses respiration. The most likely cause of this is a drug overdose, likely with an opiate; few other substances will depress breathing this much without also causing a deep coma, which that head movement and yawn argue against. See: Opiate overdose symptoms, General Discussion, and other sections. Besides the implication of dishonesty (or complex error?) with the chlorine claims, another implication of this finding: opiates or other sedatives aren't usually dispersed from barrel bombs, or anything dropped from an aircraft passing overhead. Medications are usually administered up-close, by pill or syringe. One important point to note here is that the girls at least were already in this state before being washed out in the street and run into the ER. Mohammed is not so clear (see Victims Before) But in the clinic or not, no one in the employ of the Syrian government is likely to be behind this crime, deep behind rebel lines. 2. A disturbingly unsuccessful medical effort: Human Rights Watch reviewed what they described as “disturbing video footage of doctors unsuccessfully trying to resuscitate the three children.” (HRW) They didn't say it, but the lack of success is part of what's so disturbing here. Consider how the clinic staff make no effort to save Mohammed when he stops breathing at the start of video 1, though they are in a well-equipped emergency room. At his attempt at breath described above, the only response is from the cameraman; he zooms in on Mohammed's face and, in a voice cracking with emotion, blames Assad for his death - which wasn't even a fact just yet. He does not call for help to save the boy, and no one offers it on their own. 45 second later, a doctor we dubbed M1 casually suctions out his mouth, but gives him no air or resuscitation at all. Further, another video shows Mohammed, by our visual match (see right, and note the stain above the left eye on both), in the receiving area and under the care of the same M1 mentioned. Here Mohammed was sat upright and given an oxygen mask, and for the time he didn't die. But apparently that was stopped before he was taken to the ER, it was not resumed, and he was filmed dying there. At right is a crop from video 1, 1:20; a medic is checking for a pulse on Aysha, disturbingly, by pressing both carotid arteries almost continuously for 25 seconds. At the end of that, he claims Aysha is alive ("breathing”) and urges the doctor to check. The doctors who examine her moments later, however, seem to think she's dead (end of video 1 and start of video 2). It seems - and one hopes - Mohammed was dead before 1:10 in video 2 when the doctor M1 attempts an intracardiac injection, poking in at several angles. In all this time, nothing has been done to provide artificial respiration. Every doctor and every first aid worker knows the “ABC” (airway, breathing, cardiac) rule for dealing with someone in apparent cardiorespiratory arrest. Without respiratory support, the intracardiac injection to Mohammed and the cardiac massage to the girls are irrelevant. These and other clues raise serious doubts about either the staff training or the medical ethics of this facility. They could easily give one an impression that scoring a political point in support of regime change is more important to them than saving lives. 3. The unexplained massacre site: The basement home from which the Taleb family were reportedly rescued is shown in a few videos, once as "site of the chemical massacre.” But it looks more like the site of a traditional massacre with guns and maybe blades. By reports, no one in the Taleb family was injured at all, so they probably didn't even come from here, and this site is a disturbing mystery. Why this was ever shown to us is not clear, but the White Helmets working with Human Rights Watch later offered one possible explanation. However, it's extremely strange; the government has been including small bottles of a red fluid in their chlorine barrel bombs. No strategic reason is evident and it doesn't seem anyone has bothered having the fluid tested. No one has specified that's what we're seeing here. But our belief this is probably a blood-drenched massacre site might now be taken as falling for “Assad regime” trickery. 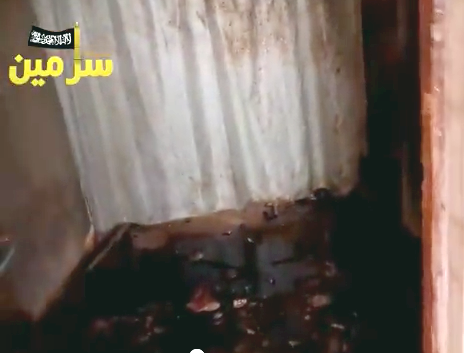 Either way, bottles of fluid inside a barrel bomb are completely inadequate to explain what the videos show – blood all down the hall, out the patio door, outside the front door, and maybe into the bedrooms. 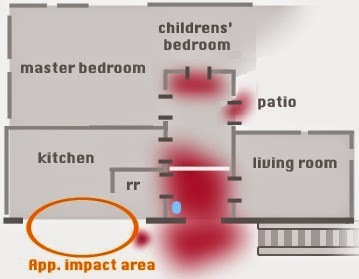 It's difficult to see how this could come naturally from an impact (non-explosive, they say) just inside the kitchen. See Attack site videoa analysis and bottles of not-blood built into the bombs? One family (Taleb) was killed, the kids with a drug OD, father and grandmother unclear, and with young adult mother not shown (she could be a captive instead of dead). Location unclear. Another family with young children was massacred in a more traditional way (no bodies shown at all), in the site shown on video as the Taleb home. 4. Activist-Terrorist cooperation: Jabhat al-Nusra (JaN) is the official branch in Syria of the global terrorist network al-Qaeda – the same al-Qaeda we've all known since around 2001. JaN is also in charge of, and has free reign over the Sarmin area in cooperation with the rebel (Sunni) Islamist Front. In fact, al-Nusra led the charge less than two weeks later to conquer the nearby regional capitol of Idlib. To the extent the Free Syrian Army works there, it's also in cooperation with al-Qaeda and the other Islamists. The degree of sectarian hatred and terrorist methodology used by JaN is not fully or widely known; they seem to most somewhat better than Daesh aka Islamic State. But they have locals they might want to kill, and reason the get their enemies in trouble or even bombed. They have easy access to chlorine, having once captured 400 tons of it, besides the factory to make more. (see here) They have mortars and such, if not helicopters. And surely they have access to common medications that could explain the manner of death of the Taleb children. 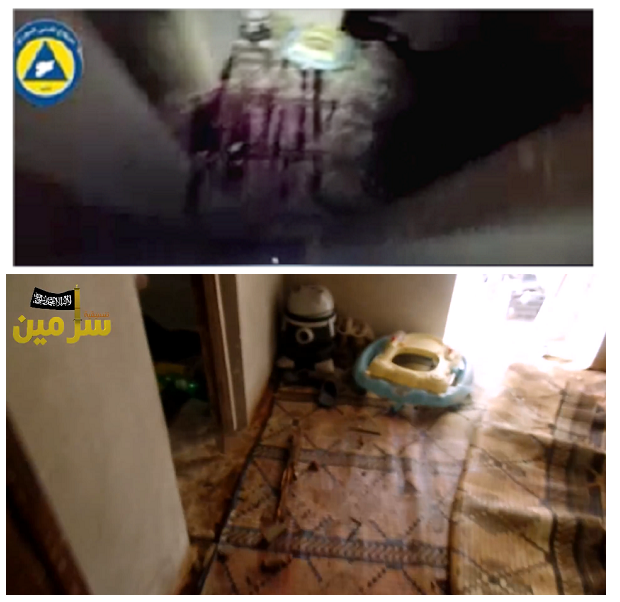 Idlib's Civil Defense branch and JaN appear to be tied together at least by videos uploaded with separate logos but sharing some of the same content, and by each providing one of the two videos shown at the UN. While some White Helmets have been seen waving the black flag of JaN (see video here), most have unknown beliefs, aside from anti-government - and one has to work with the local authorities. Most presumably would not cooperate with terrorist crimes, but either from fear or from their shared opposition to “Assad,” they can't be expected to expose an al-Nusra crime. Rather, if one should happen, be it a family massacre or a false-flag chlorine attack, Civil Defense would likely help cover it up and blame it on “Assad.” How can we be sure that's not just what happened here? The activists lodging the claims - hospital director Dr. Mohammed Tennari (alt. Tirani, T), activist Kassem Eid (aka Qusai Zakarya), and others have lodged dubious claims as direct witnesses to the March 16 incident and otherwise, or have a checkered past of outlandish and inconsistent stories. Dr. Tennari, key speaker at the UNSC session, claims to be a friend of the Taleb family and to have personally treated them that night. He says chlorine fumes from the children – who had been stripped and washed - made him sick and made a nurse faint. But that makes little sense, and he's not seen in the relevant videos from that night. He may have never been at the hospital at all, if he was even in Syria at the time. But the circumstantial clues here pale next to the key findings about what killed the Talebs. These conclusions and their implications will be troubling to many, but they are open to review and challenge. We welcome any medical opinions for or against our findings, or other relevant thoughts or information. These should be sent as soon as possible to adam@ciwclibya.org or added directly to the ACLOS page as part of the ongoing open discussion. Throughout years of Obama’s war on Syria, President Bashar al-Assad was falsely accused of using chemical weapons (CWs) numerous times. No corroborating evidence whatever indicates Syrian forces used them in any form any time. Clear evidence shows IS, Nusra Front and other anti-Syrian elements used them them against defenseless civilians – including toxic agents Saudi Arabia supplied. Anti-Syrian propaganda is relentless. Assad repeatedly faces false accusations. During a Thursday closed-door Security Council session, members heard testimonies from Syrian doctors. They alleged use of chemical weapons. A video of unexplained origin was shown with medical workers struggling to help choking and vomiting children. Washington, Britain and France once again falsely accused Assad of using CWs – despite Organization for the Prohibition of Chemical Weapons (OPCW) officials, the UN and Obama himself publicly declaring Syria chemical weapons-free. Damascus fully cooperated in their destruction. Any CWs remaining are in the hands of extremist elements – with active complicity of Saudi Arabia and perhaps other complicit rogue states. Russia alone firmly says no evidence whatever indicates Syrian CW use. He writes like that. - simple sentences that manage to be not quite correct. For example there's no contradiction with CW-free vs. CW allegations. They affirm 96% of Sarin and such is destroyed/removed, and none of the chlorine. Assad is okay, a bit bland as usual, but fairly correct. animals exposed at large doses for 5.5 min showed pulmonary oedema @ 24-72 hr. December 23, 2016 According to the resolution, a UN-established panel will “assist in the investigation and prosecution of those responsible for the most serious crimes” in Syria. As the sarin case fell apart in 2014, the U.S. government shifted its emphasis toward chlorine-gas allegations. For example, it’s alleged that this weaponry is dropped by helicopter, and yet there is almost none if any video [of such attacks]. 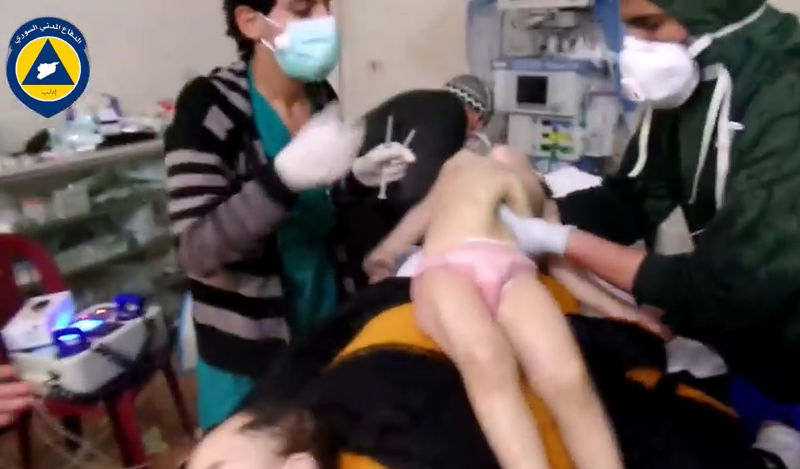 (Reuters) - Members of the United Nations Security Council teared up on Thursday when Syrian doctors showed a video of failed attempts to resuscitate three children after a chlorine gas attack in March, prompting renewed calls for accountability. with one strike killing six members of a family, including three children. by witness accounts and photo and video evidence, while three others “require follow-up inquiries”. ..but exposure to refrigerants alone would not account for the smell of chlorine. ..It was not possible to conclusively determine what toxic chemicals were used, Human Rights Watch said. used in a heat pump and refrigeration cycle. In most cycles it undergoes phase transitions from a liquid to a gas and back again. Many working fluids have been used for such purposes. Fluorocarbons, especially chlorofluorocarbons, became commonplace in the 20th century, but they are being phased out because of their ozone depletion effects. Other common refrigerants used in various applications are ammonia, sulfur dioxide, and non-halogenated hydrocarbons such as propane. claiming he is the Director of the Sarmin Hospital, a Radiologist, who at the age of 35 has been practicing medicine for about 7 years. He is also supposedly affiliated with SAMS, Syrian American Medical Society. But the SAMS website lists no such person. unless he began his bachelor degree program at the age of 14… just sayin’. “It was dark so we couldn’t see any particular colour in the sky,” stated the hospital director. The attacks happened around the rebel-controlled town of Sarmin, in Idlib region. MSF is supporting the Sarmin hospital where the wounded were treated and received reports of the dead and wounded. “Attacking a village and its civilian population with chlorine shows once again that the Syrian conflict knows no limits,” said Dr Mego Terzian, MSF President. Two rescue workers and an activist who were at the impact site shortly after the attacks to evacuate people told Human Rights Watch that they smelled chlorine at the attack sites. Two doctors who treated those affected by the attacks reported smelling chlorine on the victims’ clothes. who went to Aleppo on behalf of the Syrian American Medical Society. Born in Algeria to Syrian parents who were teachers, Sahloul spent most of his young life in Syria, where he went to medical school before coming to Chicago in 1989.
said Dr Zaher Sahloul, a Chicago-based pulmonologist and president of SAMS. Sahloul estimates up to 300,000 excessive deaths because of a lack of access to routine medication for chronic diseases such as diabetes and lung disease, along with premature deaths from infectious diseases, malnutrition and neonatal problems. On Oct. 23, 2015, Jund al Aqsa announced its split from the Jaysh al Fateh coalition in Syria. Suqour al-Sham, or Sham Falcons brigade . 2014 (..) About 100 fighters declined, and returned home with the news. an insurgent in the operation who provided footage of the attack said Thursday. ..As Mr. Aboud gained power his activities sometimes turned sinister. Mr. Aasi said he became involved in the abductions of Alawites, and sought ransoms for their release. Other rebel leaders once intervened to stop the Dawood Brigade from executing civilians near Fuoa, a government-controlled town, Mr. Aasi said; among the detainees were women and a child. Dr. Osama Abo-Ez is one of those who has remained in rebel-held Aleppo since 2011, despite the dangers. His wife and children have moved across the border into Turkey for their safety, and he is on a short visit there, but even though the city is now under siege, the surgeon says he plans to return to Syria within days. ..Attar and the SAMS team made it out of eastern Aleppo during a lull in the bombardment that has closed the city off, but the dedicated permanent staff at the hospital is still there, doing all they can to save lives as their supplies -- medication, food and even electricity -- run down. Last month there were 42 attacks on medical facilities in Syria, 15 of which were hospitals in which my colleagues and I work. At this rate, our medical services in Aleppo could be completely destroyed in a month, leaving 300,000 people to die. headed by “Dr.Hamza al Khatieb”! unter dem Terroristen und vielpropagaierten Arzt “Dr.Hamza al Khatieb”! The jihadist rebels of Fatah Halab and Jabhat Fateh Al-Sham carried out another heinous massacre prior to leaving the last east Aleppo neighborhoods this past week, an SAA officer from the Republican Guard told Al-Masdar News on Friday. were summarily executed by the jihadist rebels prior to their departure from the Sukkari and Bustan Al-Qasr districts of east Aleppo. "These massacred soldiers were comprised of men that were captured by the jihadist rebels over a four year span in the Aleppo Governorate; they were unable to smuggle their hostages from the Sukkari School, so they chose to execute them instead," the SAA officer added. Some reports indicate that a large number of the executed soldiers were beheaded before the jihadist rebels left; this could not be verified by Al-Masdar. The Syrian Arab Army's High Command demanded the release of these soldiers before the jihadists departed from east Aleppo; however, the latter denied having any hostages. Syria Chlorine Allegations: Why Chlorine?